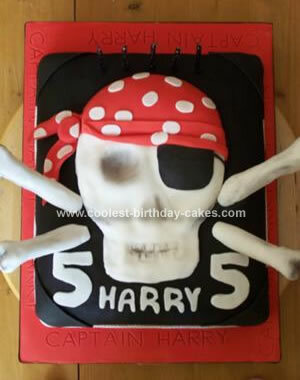 This pirate skull birthday cake was made for a little lad of one of my husband’s colleagues, he is made about pirates. I made a rectangle cake and iced it. I then cut out a skull shape and used some molded lumps of icing underneath to shape the eyes, cheeks and mouth and place the cut out over them. I used some black food colour powder for shading and for the crossbones, I covered some wooden dowels with the icing, leaving a couple of inches uncovered to go into the cake and shaded in the same way as for the skull. I let these dry thoroughly before I put them in. Birthday cake idea Posted by Mandy B.
Congratulations, that is an awesome cake… I was looking for some inspiration for my son’s bday, and I just got it, thanks!!! I will be using marshmallow fondant for the skull etc. I am just looking for a boys 11 yr cake idea and this is quite something. Very clever idea.